By Ret Talbot • Matt Pedersen • Matthew L. Wittenrich, Ph.D. • Foreword by Dr. Gerald R. Allen with Martin A. Moe, Jr., Roy Yanong, V.M.D. and Thomas Waltzek, D.V.M., Ph.D.
Join the international Banggai Rescue expedition as it explores the native range of the species in the remote Banggai Archipelago in Sulawesi, Indonesia • Meet indigenous fishing families and Indonesian biologists struggling to protect the species from rapacious poaching and overfishing • See the biological consequences of Pterapogon kauderni as an invasive species introduced to areas where it never previously existed. Learn the secrets of small-scale Banggai Cardinalfish breeding • Visit the fishrooms of successful breeders • Get the basics as well as advanced tricks for: Establishing broodstock • Conditioning and spawning • Rearing healthy fry • Marketing and selling your captive-bred Banggais. 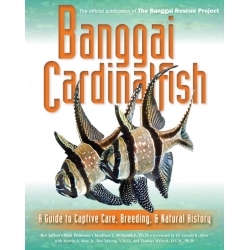 "The new bible for every Banggai Cardinalfish enthusiast and breeder." In Stock: Now Available for Download!